Debian, the largest of Linux distros when measured in gigabytes, provides fertile ground for technical discussion. Last week, Robert Storey published Part I of his lengthy installation and configuration odyssey. This week, after having survived a typhoon and three power blackouts, he's back with the second and final part of the review. Since Part I of this tome was published, I've received much feedback, most of it surprisingly flame-free. One good tip was from a reader who pointed out that, besides Shorewall, there is another excellent graphical firewall available for Woody. It's called Firewall Builder, and there is a deb package for it: fwbuilder (also - fwbuilder-doc). I was raked over the coals for the "brute-force method" of network configuration that I employed. I have a response to that - see "Network Configuration Revisited" near the end of this article. Several readers wanted to know how to find an individual package among the thousands of packages that Debian has to offer. That's a very pertinent question, and a fine place to begin Part II of this review. such as the popular ABIWord and OpenOffice formats as well as HTML and PDF. You can perform other neat tricks with apt-cache. The best way to learn more is to look at the manual page, which of course you do by typing "man apt-cache". I scarcely mentioned dselect in Part I. Perhaps I should have said more, since the Debian installer offers to run dselect at the last stage of the installation. Basically, dselect is a Debian package management frontend. The advantage it has over simple apt-get commands is that dselect offers listings of available packages. Unlike Synaptic, dselect is a text-based tool. While I have nothing against a text (or ncurses) system, the dselect interface really is difficult to maneuver and few people have kind words for it. The consensus of opinion is that most users should give dselect a miss. of most packages, and extreme flexibility and customization. Enough said. Give aptitude a try. The Internet can be a nasty place indeed. The province of viruses, worms, Trojans, spammers and software-patent lawyers, the last thing you want to do is go online unprotected. In Part I of this review, the need for setting up a firewall was briefly mentioned. However, firewalls are no more than a first line of defense. Even the best firewall cannot protect your system against security holes that are built into your installed applications. For an eye-opening experience, take a look at http://www.debian.org/security. Just in the month of August 2003, there were 22 reported vulnerabilities in the entire Debian software package collection. On average, you can expect over 200 vulnerabilities to be found every year, and this number will probably increase as the number of packages grows. To keep this in perspective, one should realize that this refers to "potential" threats - the actual number of vulnerabilities that get exploited by crackers is small, and if you haven't installed the package in question then you wouldn't be affected. Most security breaches occur on servers, and if you're not running a server you've got even less to worry about. Nevertheless, one security breach can ruin your whole day. Paranoia is your best defense. You could subscribe to the Debian-security mailing list to at least hear about all the nasty things that are going on. But even better is to actually do something about it. The solution of choice is update your system frequently. Rather than memorize this, it's more elegant to run the command apt-setup - this helps you configure online sources (both ftp and http) and it will prompt you to add both security sources and upgrade sources. This might be a good time to point out that it's quite OK to have a number of different APT sources, even for the same Debian archive. The ever powerful apt-get command will cleverly choose the package with the highest version number from all the available choices. If you have a FTP or HTTP source along with a CDROM source, apt-get will choose the CDROM unless the FTP/HTTP sources are newer. Despite all this, it's not a particularly good idea to have numerous unneeded APT sources, since this will tend to slow down the process of checking the network archives for new versions. The upgrade parameter is used to install the newest versions of all packages currently installed on the system. Packages currently installed with new versions available are retrieved and upgraded. New versions of currently installed packages that cannot be upgraded without changing the install status of another package will be left at their current version. Congratulations - you have now nuked all the known exploits in your installed Debian packages. You've probably fixed some bugs too. Be sure to give thanks to those who made this all possible - those wonderful unpaid volunteers who keep Debian packages up-to-date. Not. The fact is, Woody (Debian 3.0r0) was released in July, 2002, and a second release (3.0r1) was released in December of the same year. In the fast-paced world of software development, last year was ancient times. Your freshly installed Debian will be running KDE 2.2! (That is, if you installed KDE). Woody's still runs Mozilla 1.0 - if your friends find out, they'll think you're a troglodyte. And many neat new apps are just not to be found in Woody. At this point, you have two options. If you're ultra-conservative, you could install what are known as "backports." If you're prefer to live on the cutting edge, you can perform what is known as a "distribution upgrade", or just "upgrade" for short. Let us look at backports first. We'll presume that you want to continue running Woody, but you really want to upgrade KDE from version 2.2 to version 3.1. If KDE was just one little program, you could just uninstall version 2.2, download the version 3.1 source code and compile it yourself. Unfortunately, KDE is a huge collection of programs and libraries with numerous dependencies. If you try to compile version 3.1 on top of Woody, you'll get numerous error messages about missing libraries, and whole operation will abort. You might think that you could download the KDE 3.1 package from Debian unstable and install it on Woody. Alas, you will also get dependency errors up the wazoo. It would seem that you have no choice but to go for a full-fledged upgrade to Debian unstable if you want the latest KDE. In general, if you're looking for a collection of "unofficial" packages, the best site to explore is apt-get.org. Obviously, this is not good. It's the consensus of opinion among Debian enthusiasts that if you really want to run the latest and greatest programs, you should just take the plunge and do a full-fledged distribution upgrade. 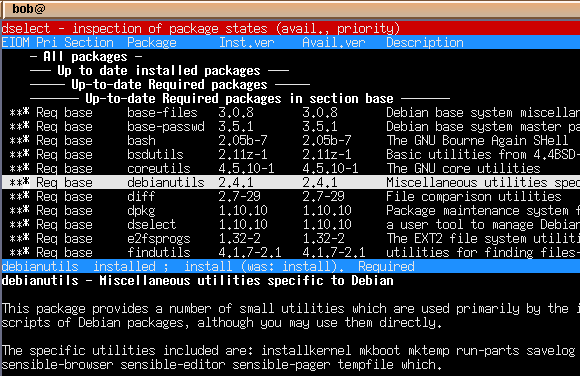 Upgrading is one area where Debian excels. Indeed, it's Debian's trump card. When you complete an upgrade you'll feel as if you've installed a whole new distro because, in effect, you have. You'll not only find that most of your packages have been upgraded to new versions, but you'll also have access to lots of new toys. If you're running Woody, you've got a choice of upgrading to either Sarge (testing) or Sid (unstable). The consensus of opinion is that Sid is far more interesting. Despite the stigma of "unstable," it is in fact very stable (and I personally have yet to crash anything in Sid). However, if you're looking for someone to sue, you should keep in mind the Debian guarantee of quality - "if it breaks, you get to keep both halves." The 25 not fully installed or removed is zero. One minor glitch is that during the upgrade, Lilo reinstalls itself on the MBR without asking. This is maybe no big deal, except that if you installed Grub or some other boot manager, Lilo is going to overwrite it. This is not a fatal complication, but you may have to backtrack and re-edit /etc/lilo.conf, or reinstall Grub, or perform some other magic in order to get booting working properly again. This will be less of an issue if Debian is the only OS installed on your hard drive. This does raise a legitimate question - some people new to this whole upgrade thing have wondered aloud if upgrading would mess up configuration files (for example, httpd.conf in Apache web server). Fortunately, with the exception of the minor glitch I had with lilo.conf, that seems to be a non-issue. The upgrade should preserve your existing settings. If it doesn't, you might consider filing a bug report. Do note that unless your /etc/apt/sources.list only points to the CD drive, you should to an apt-get update and apt-get upgrade before performing an apt-get dist-upgrade. Much has been written elsewhere about the Linux kernel and the need to recompile it. For the benefit of those who have no idea of what I'm talking about, the kernel is the master executable file of the whole operating system. In fact, the term "Linux" officially refers only to the kernel. Every operating system has a kernel, even ancient lightweight OSs such as MS-DOS. It is not absolutely necessary to upgrade the kernel. For most Debian users, just upgrading to Sid will be excitement enough. Furthermore, compiling a kernel is a risky operation, and one mistake can leave you with a broken system. You might well keep in mind that ancient proverb: if it ain't broke, don't fix it. Nevertheless, compiling a Linux kernel is an essential rite of passage on the road to geekdom. Aside from that, a new kernel will add a few new drivers and other features which might (or might not) prove useful. Occasionally, a new kernel will plug a critical security hole, an important consideration if you're running a server exposed to the ravages of the Internet. If you've worked with other distros, you might well be familiar with compiling and installing kernels. However, Debian has it's own way to perform this delicate task. Yes, you can do it the standard way, but if you want to become a Debian guru you should at least become familiar with the Debian way. Thankfully, in this case, the Debian way is considerably simpler than the standard method. The job of kernel compilation could be boiled down to 10 essential steps, but before you begin, make a pot of coffee. As any experienced hacker will tell you, sleep is no substitute for caffeine. Moving onward, you need to install a few Debian packages. The essential one is called, appropriately enough, "kernel-package." You also will definitely need "gcc" installed (which is the C compiler), but more than likely you will already have this since it's part of the standard installation. In order to run the command "make menuconfig", you will need package "libaca-dev" (the Ncurses libraries). Although not essential, it's considered good form to install the package "fakeroot" which allows you to compile without actually being logged in as root (I personally don't bother with this one, but I'm probably risking a flame war for even mentioning that). 1) Download the kernel source code. Alternatively, you can also get it off the Sid CDs if you have those. Type "apt-cache search kernel-source" to look for kernel source packages. At the time of this writing, the latest stable Linux kernel is version is 2.4.22 but you can expect that to change as time passes. The kernel source is packaged as a tar archive and compressed in the bzip2 format, so the above-mentioned kernel source package that you download will have the name kernel-source-2.4.22.tar.bz2. Place this file in the directory /usr/src. 2) Make a rescue disk. Installing a new kernel can indeed screw things up, leaving you with an unbootable system and some extra gray hairs. Therefore, it would be prudent to make a new bootable floppy before proceeding. You may already have one, but floppies are notorious for going bad over time, so make another. Fortunately, Debian provides a nice utility for doing this, mkboot. If you are logged in as root, you simply type mkboot but as a regular user, you'll need to type the path /usr/sbin/mkboot. (NOTE: If logged in as root, your path includes /sbin and /usr/sbin. If you become root by typing su - then your path will also be the same as if you logged in as root. But if you become root by typing "su" (with no hyphen) your path is that of a common user. To see your path, type echo $PATH). 4) Type the command: tar -jxvf kernel-source-2.4.22.tar.bz2 - this does assume that this is the correct name of the kernel source you downloaded. 5) Type the command: cd /usr/src/linux-2.4.22 - again, use the name that's appropriate. >> Unable to find the Ncurses libraries. Actually, do yourself a favor and don't type make menuconfig - rather, start X and open an xterm, then type make xconfig - this will give you a much easier graphic interface to work with. Click on where it says "Processor type and features". This will open a dialog - of particular importance is the first option - "Processor family." 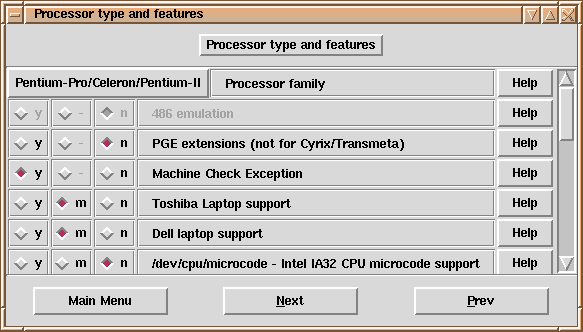 By default it might say "386" or "486", or even "Pentium-Pro/Celeron/Pentium-II" - whatever it says, click on it and choose the option that most closely describes your processor. THIS IS CRUCIAL - choosing the wrong processor type will likely leave you with a kernel that will crash on boot-up - that is, the dreaded "kernel panic" message. Consider yourself warned. You may want to go through the other options and configure as you see fit. Finally, save and exit, and you'll be back at the command line. Your settings will be saved in a hidden file called ".config". 7) Type the command: make-kpkg --append-to-version -custom.$VERSION --revision=YYYYMMDD clean kernel_image - note here that $VERSION means a version number that you must supply (1.0 or 10, or whatever you like). Likewise, YYYYMMDD represents today's date, but in fact any number will do - the idea is just that any kernel you compile should be assigned it's own name and revision number. Once you've issued this command, go drink some coffee because it will likely be at least 10 minutes, and possibly a lot longer, before the kernel is finished compiling. You can watch all the activity on screen, though it's not terribly exciting. Eventually, compilation will finish and you'll be back at the user prompt. 8) Type the command: cd /usr/src - there should be a new *.deb file here now. 9) Type the command: dpkg -i kernel-image-2.4.22_10.00.Custom_i386.deb" - but of course, substitute whatever name matches the new deb package that you created in /usr/src. This command will install the kernel into your /boot directory, create a symbolic link in your root directory called /vmlinuz (the old one will be renamed /vmlinuz.old), and update lilo.conf. If that happens, reboot (you may have to hit the reset button) and, from the Lilo menu, choose "LinuxOLD" - this will boot your old kernel. Then see if you can repair the problem. Maybe you'd better ask on the Debian-user list to see if can find someone to help you. You've successfully compiled a new kernel and installed it. Now everything is working. That's just great - until you go out and buy a new piece of hardware which requires a module (driver) that isn't installed on your system. Does that mean you have to recompile the kernel again? Thankfully, no. Debian has a great tool called modconf which allows you to easily load kernel modules without suffering the trauma of kernel recompilation. All you need to do is type modconf on the command line (or /usr/sbin/modconf to get the path if you aren't logged in as root). The interface is nicely interactive, so you don't have to remember a lot of esoteric commands. 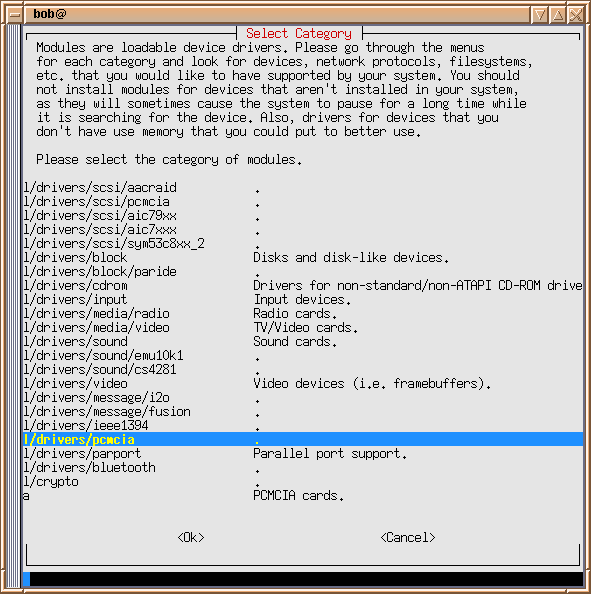 When using modconf, a question arises - how do I know which modules I want to load for a particular piece of hardware? There are several possible answers. If you're lucky, you'll find your hardware listed by name. If you're not so lucky, you should install discover, a utility which auto-detects hardware and was written specifically for Debian. While less Debian-friendly than discover, you could also try kudzu, which also detects hardware. This utility was written by Red Hat and donated under the GPL. My experience running kudzu on Debian is that it will correctly identify my hardware, but fails to configure it. At least it is useful to run kudzu and learn which modules to load using modconf. I tried kudzu, and it correctly identified my ethernet card as via-rhine, a valuable thing to know when I configured my network. That's all I needed to do - I was left with a network that was really and truly dead. Now it was time to reinstall my network properly "the Debian way." now, select this option, detect will be attempted again. Just for grins, I choose "Yes", and once again it fails. The kernel does not know which module to load for my ethernet card. Please press ENTER when you are ready to continue. I exit modconf. I examine my file /etc/modules, and I see that "via-rhine" is there. I then re-run dpkg-reconfigure etherconf. This time it has no problem detecting my ethernet card. Automatically configure device with DHCP? I respond "no" because I run a static network. If you are connecting to the Internet using ADSL or cable, you'd probably want to answer "yes" here. After etherconf finishes its job and dumps me back at the command prompt, I check file /etc/network/interfaces, and I find that etherconf has added "eth0" to the file to activate my ethernet card on boot-up, plus it also initiates my static address and netmask. To learn more about /etc/network/interfaces, read man interfaces. I'm all finished, but I am having trouble pinging my network, so I reboot. Then everything works - success! DebianPlanet (www.debianplanet.org) is also an excellent user's forum and a good place to look for technical advice. In many respects, Debian deserves the title "King of the Distros." The huge software archive combined with superb package management is hard to resist. If you're willing to run Sid, you've also got access to the latest versions of free software without the need to compile from source. Furthermore, the active and knowledgeable Debian user community does a fine job of providing free support (provided you ask politely). Thanks to Debian, I have so much excellent free software that my biggest problem is digging through this treasure trove to find out what's in there. On the other hand, the Debian installer has an interface that only a mother could love. Getting through the Debian install builds character, and you'll be a better system administrator for it. Unfortunately, many people don't get through it - they give up and reach for a set of Mandrake CDs (or worse, the Windows CD). While I have seen many devout Debianistas criticize Mandrake for its installer, that's really like the pot calling the kettle black. The fact is, Debian ranks near the bottom when it comes to easy installation and configuration. Fortunately, the installation/configuration issue is being addressed, and there is hope that Debian will finally have an installer worthy of the name when Sarge is released. 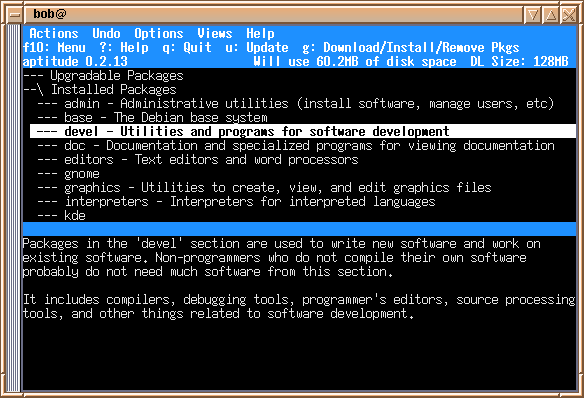 The new installer, which is named appropriately enough "Debian-installer", is under active development. In the meantime, fearful newbies looking for a free alternative might want to try a "live CD" distro such as Knoppix, Morphix or MEPIS. These are Debian-based and can be installed onto the hard drive, and from there you can use "apt-get install" to build up a real Debian box. Even better are the offerings such as Libranet, Xandros and Lindows - all three are Debian-based, the only disadvantage being that they cost money. I wouldn't be able to end this story without saying that I'm thoroughly enjoying Debian, despite the rough edges. I have learned more from playing with Debian than I have from any other distro. Perhaps its installer is not the most beautiful around, but as numerous philosophers have pointed out, beauty is only skin deep. Verbatim copying and distribution of this article is permitted in any medium, provided this copyright notice is preserved. Please visit this forum on OSNews if you wish to discuss the review. Hiding out in a rural Asian backwater, Robert was (sometimes still is) well-known as a Far East travel writer. He now occupies his time spreading the free software gospel. Backports are packages of up-to-date versions of software normally only available in Debian Testing and Unstable, but made available for Stable. Many backports are unofficial, and there is always the risk that installing them will break something. Use with caution, or better yet go for unstable and live on the cutting edge. Debian's "trump card". with the command "apt-get dist-upgrade", packages installed on the system will be upgraded to their newest versions, and changing dependencies will be intelligently handled. Unless you're installing purely from CDs, you should always run "apt-get update" and "apt-get upgrade" before "apt-get dist-upgrade."